This winter's deep snow and extended period of snowcover posed serious problems for rabbits. Denied access to food on the ground, rabbits fed extensively on small trees and shrubs that stuck above the snow. 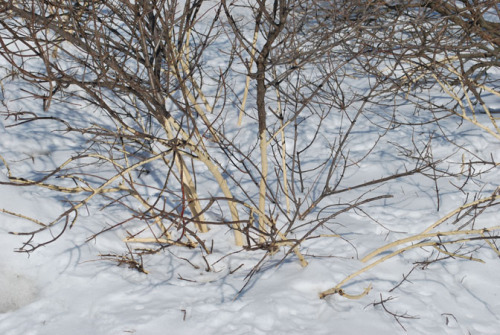 Damage has been common on crabapples, apples, plums, cherries, serviceberries, winged euonymus (burning bush), cotoneasters, viburnums, dogwoods, spireas, and many other woody plants. See photos below. What about bridge grafting? Some girdled trees can be saved by bridge grafting. However, bridge grafting is a difficult procedure for home gardeners. 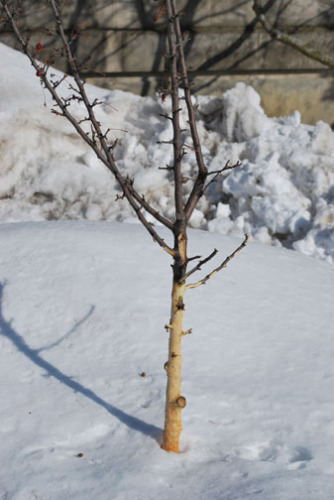 Most girdled trees will sucker at their base and since most fruit and ornamental trees are produced by grafting, suckers that originate from below the graft union will not produce a desirable tree. Instructions on bridge grafting (see below) are available from the University of Minnesota pamphlet WW-00532, "Grafting and Budding Fruit Trees." Links to this article are strongly encouraged, and this article may be republished without further permission if published as written and if credit is given to the author, Horticulture and Home Pest News, and Iowa State University Extension and Outreach. If this article is to be used in any other manner, permission from the author is required. This article was originally published on March 17, 2010. The information contained within may not be the most current and accurate depending on when it is accessed. Rabbits have damaged several trees and shrubs in my yard. Can I do anything to save them?